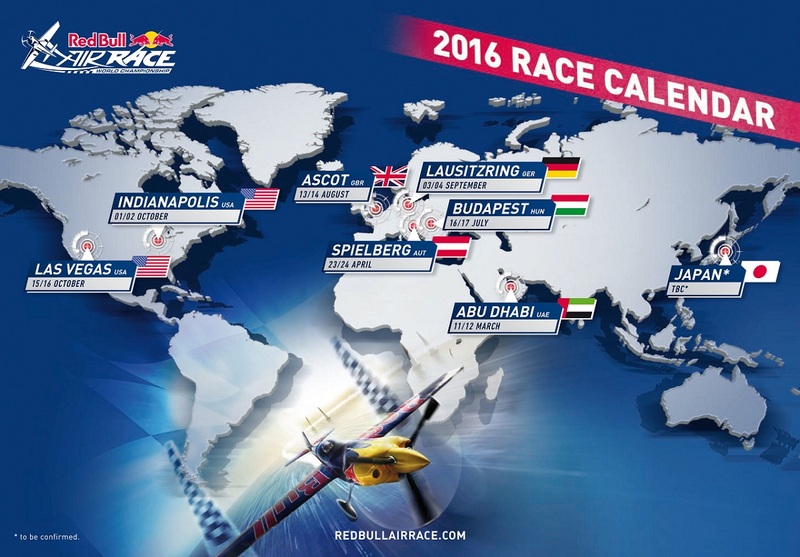 RED BULL AIR RACE: Red Bull Air Race 2016 Calendar Announced With New locations in Germany and U.S. The eight-race 2016 World Championship season will feature a long-awaited return to a famed German auto-racing track, as well as a historic debut in the U.S. city that’s home to one of the most prestigious motorsport races on the planet. Salzburg, (Austria) – The Red Bull Air Race World Championship will mark its ninth season in 2016 with two exciting new stops where fans are passionate about motorsports: the famed Lausitzring in Germany and the U.S. city of Indianapolis, Indiana, home to the Indianapolis 500 that’s renowned as part of the “Triple Crown” of auto racing. In a season that spans seven countries over eight races, the motorsport series will also captivate spectators at stops that have already become favorites in the calendar. It all kicks off on March 11/12, with the traditional season opener over the Arabian Gulf in Abu Dhabi, United Arab Emirates for the ninth straight time. Next up, the action is back at the Red Bull Ring in Spielberg, Austria – one of the highlight venues in the Formula One calendar on 23/24 April. The high-speed, low-altitude race will then return to Japan, following the overwhelming success of the debut race in 2015 that sold out across the weekend. The Championship then moves to Budapest, Hungary on July 16/17 where the racetrack’s 25-meter-high pylons are set up in the heart of the city, contrasting with the stunning backdrop of the Parliament Building, a location which has hosted seven races. On August 13/14, the setting is Ascot in England, the renowned horse-racing track that has proven to be one of the all-time favorite stops in the history of the sport, before the series makes that breathlessly anticipated return to the Lausitzring on September 3/4, where fans will be able to savor a race in Germany for the first time since 2010 and cheer local Master Class pilot Matthias Dolderer. Once again the final two races of the season will be in North America; first, on October 1/2, with the Red Bull Air Race premiere at Indianapolis Motor Speedway in Indianapolis, a sport-loving city in the country’s heartland where motorsport is king. The Speedway will also be celebrating 100 years of aviation events, as the first race held at IMS was also the first national balloon race, in 1909, the same year the world’s first air race took place in Reims, France. The season finale happens on October 15/16 in Las Vegas, Nevada, where the new World Champion will be crowned at the Las Vegas Motor Speedway. 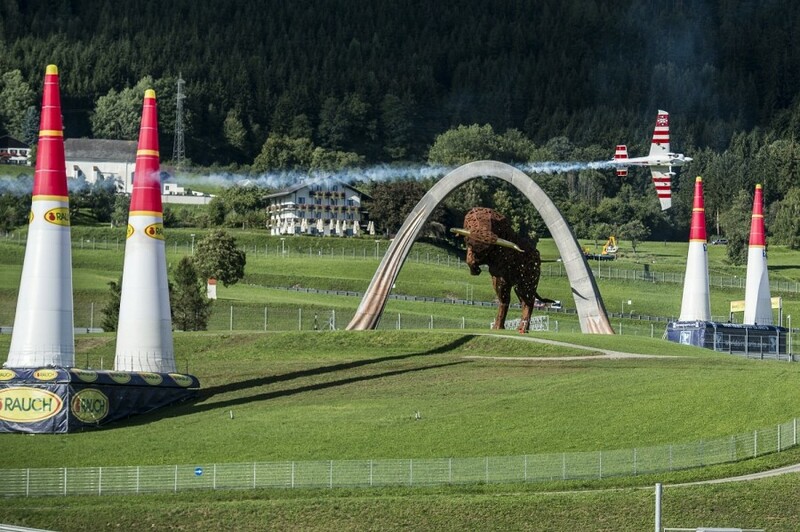 Airshow News > > RED BULL AIR RACE: Red Bull Air Race 2016 Calendar Announced With New locations in Germany and U.S.